These are the latest 2014 Issue notes with improved security modifications. Not easy to get . All our notes have been verified as genuine on a De La Rue Machine . 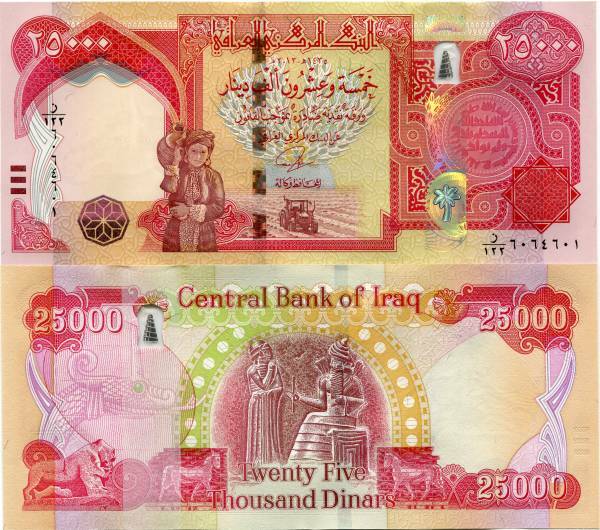 Buying Iraqi Dinar is a high risk purchase . In addition , if Iraq changes it´s currency in the future it will be a highly complicated procedure and we cannot make any guarantees that we can assist with this . Only purchase what you can afford to lose . In addition we neither partake in nor agree with overnight RV rumors that have been going on for years . We simply buy and sell the currency. Whilst every effort is made to securely ship Dinars purchased from us , we are not responsible for customs issues in your country neither for theft or loss of the parcel . We cannot process orders for banknotes over $1000 per client per day, please do not exceed this value,else we will refund your order.